With high-school graduation behind them, it was time for the Cates twins to decide upon a career course. Neither wanted the stable but strenuous future of life on the Cates family farm. For Levi, a painter’s job at the local cement factory beckoned. This is the bio of Eli, the brother who chose to pursue a livelihood in professional baseball. A marginally talented right-handed pitcher and utility player who bounced from place to place, Eli Cates spent almost 20 years in the game, wearing the livery of some 30 different semipro, independent professional, outlaw, winter league, and minor-league ballclubs. His crowning achievement was spending the entire 1908 season in the American League as a member of the Washington Senators. Five years later, a late-career shot at a major-league encore was short-circuited by an ironic event: a farm accident. While helping the family bring in the late fall corn harvest, Eli suffered a debilitating arm injury. His professional pitching days were over but a long life still lay ahead. Cates settled down, held various jobs, raised a large family, and remained a close follower of the game until his death at age 87. By now a sturdy 5-feet-9, 175 pounds,8 Cates debuted with a seven-hit, complete-game victory over the Mansfield Haymakers. Thereafter, he also “pitched fine ball” against Springfield but dropped a 3-2 decision, the opposition runs all coming courtesy of a bases-loaded throwing error by Cates himself.9 In eight games Eli posted a 4-4 record for the Mud Hens. A righty batter, he hit a respectable .267 (8-for-30). In all, it was not a bad start. The following season, Cates blossomed. He went 21-12 in 39 appearances for Toledo,10 and was selected by the Cincinnati Reds in the postseason minor-league player draft.11 Unhappily for Cates, he never received a chance to show Cincinnati his stuff. That winter he was optioned to or drafted by – accounts differ – the Kansas City Blues of the minor American (née Western) League.12 Whichever the process, Cates was still in the minors. At Kansas City Cates promptly demonstrated that he was not yet ready for the big leagues. He was hit hard (106 base hits surrendered in 66 innings pitched) and went 2-5. In late June he was unconditionally released.13 The time spent in Kansas City, however, was not a complete loss for Eli. While there, he made the acquaintance of Kathryn Cooley. The two were married in November of 1900,14 but little evidence of the union survives. All that can be said is that at least one child (name unknown) was born and that the couple divorced sometime after 1907.15 Meanwhile, Eli had resumed his playing career, re-signing with Toledo and posting a 9-5 log for the remainder of the 1900 season. An attempt to take a competitive step up was again unavailing in 1901. Cates was signed by the Minneapolis Millers of the fast Western League,16 but proved a bust. By late June, he was one of three “useless” players traded to league rivals by Millers manager A.B. Beall.17 Brief tours of duty with the Colorado Springs Millionaires and the Des Moines Hawkeyes were also unsuccessful. By mid-August, Cates was pitching for the Shreveport Giants of the Southern Association,18 but he was soon in disfavor there, as well. His performance was mediocre, and Cates’s chronic complaining about umpire calls on balls and strikes – decades later it was recalled that Eli had been known as Cry Baby Cates19 – was particularly grating to Association observers.20 Released by Shreveport the following spring, Cates signed with the Rochester Bronchos of the Eastern League.21 There, he was considered “the hard luck slab artist of the league,”22 having lost several close decisions on his way to posting a winless (0-9) record for Rochester. By midsummer, Cates was out of Organized Baseball and back home in Indiana pitching semipro ball. Cates revived his professional career in 1903, pitching the Sedalia (Missouri) Gold Bugs to the title in the lowly (Class D) Missouri Valley League.23 The following season he returned to the MVL, now promoted to Class C minor-league status, and went 16-18 for the Leavenworth (Kansas) Orioles. Cates then took a major step upward, joining the Portland Giants of the Class A Pacific Coast League. Early in the 1905 season he was sidelined by typhoid, but recovered to post a 10-11 record for the fifth-place (94-110) Giants. In late September, a favorably impressed Seattle Times declared that “Cates is good any day he is pitched.”24 But Eli was unable to see the grueling PCL schedule to its end. The following month, he “was called East on account of the serious illness of his child.”25 The fate of that unidentified child is unknown, but Cates’s time with Portland had run its course. Portland had reserved Cates for the 1906 season,26 but the next spring it was reported that Cates wished to remain closer to home and was angling for a spot on the Joplin (Missouri) Miners of the Class C Western Association.27 In time Cates was persuaded to return to the PCL, but not as a member of the Portland club. Rather, he became the workhorse of the rival Oakland Oaks. Pitching for a bad (77-110) team, Cates impressed. He went 24-24, with a commendable 2.60 ERA in an exhausting 422⅓ innings pitched. He also played 27 games in the Oakland outfield (but batted a meager .191). He highlighted the season with a 7-0 no-hitter thrown at the Fresno Raisin Eaters on September 2. Regrettably for Eli, the wide expectation that he would be drafted that winter by a major-league club went unrealized. Cates established himself as worthy of a big-league tryout the following year. The 1907 season also featured the first discovered report that Cates was now throwing a spitball.28 After hard-nosed salary negotiations – Oakland manager George Van Haltren publicly complained that “Cates wants the earth, as well as transportation [to the West Coast] for his family”29 – Eli returned to the Oaks and turned in another year of yeoman service. He also fired his second no-hitter, a 2-1 gem against Portland on June 25. In late July Cates’s contract was purchased by the Washington Senators, with delivery slated for the following spring.30 By season’s end, the Cates log stood at 21-24, with a PCL-leading 226 strikeouts and a 2.19 ERA in 436⅓ innings pitched. Come 1908, Eli would finally be getting the major-league opportunity he had been seeking, but the 850-plus innings he had thrown the previous two seasons had taken their toll on his right arm. Washington club boss Joe Cantillon had overstocked the Senators reserved list, and more than 40 hopefuls were invited to spring camp. A sticking point with Cates, always a tough negotiator, was money. The $2,400 salary offered by Washington was acceptable, but Eli also wanted a slice of the purchase price (reportedly $3,000) that the club had paid Oakland for his release. Otherwise, he would pitch for Fresno of the outlaw California State League.31 In time, he relented, grudgingly, on the purchase-price demand and accepted Washington’s terms. Thereafter, Cates showed well on the mound in camp, and enhanced his value to the club by taking an occasional turn in left field. With the regular-season roster restricted to 14 players, Cates’s versatility made him an asset and he made the Opening Day roster – as a 31-year-old rookie. Five games into the 1908 season, Cates made his major-league debut, coming on in the third inning in relief of starter Hank Gehring. Although he surrendered 10 hits, Eli kept Washington in the game, yielding only two runs over the final 7⅔ innings of a 4-3 loss to the New York Highlanders. The outcome prompted the Washington Evening Star to remark: “Too bad Cantillon did not start Cates.”32 On April 29 Cates got his first start, against the Philadelphia A’s, and pitched decently, dropping a 3-2 decision. A month later he registered a complete-game victory, shutting down Boston on three hits, 6-1. But recurring arm miseries limited his assignments, and Cates would get only 10 starts the entire season. One of these, a June 25 outing against Boston, produced the most memorable game of Eli Cates’s career: a 13-inning duel with the venerable Cy Young that ended in a 2-1 defeat. Decades later Eli would describe the contest as “the game I liked the most of all I played”33 (perhaps because as Cates remembered it, he was the winning pitcher, not Young). In early August, Cates saw action at second base when an injury to shortstop George McBride necessitated the temporary reshuffling of the infield. Although he went hitless at the plate in three games, “Cates play at second was a revelation,” reported the Washington Evening Star. “He filled the position as if it had been his all his life.”34 After that, Eli returned to spot-starter duty, the high point being a Walter Johnson-assisted 6-1 victory over Philadelphia on September 15. Pitching for a seventh-place (67-85) Senators club, Cates finished the season at 4-8, with a respectable 2.53 ERA in 113⅔ innings pitched. In 19 outings (10 starts, seven complete games), he struck out 33 enemy batters, walked 32, and yielded a .261 opponents batting average. His own offensive stats were minimal: a (11-for-59) .186 batting average, with two extra-base hits and three RBIs. While far from eye-popping, the performance was nevertheless sufficient for Washington to reserve Cates for the 1909 season. But unbeknownst to Eli, he would never play another major-league game. Dropped by Indianapolis, Cates sought a job with the South Bend (Indiana) Benders of the Class C Southern Michigan Association, but was turned down.53 The 16-season professional playing career of Eli Cates had reached its end. About to start a large family, Cates got a job as an assembler at a Delco-Remy Electric Company plant in Anderson, the small Indiana city where he had pitched earlier. For several summers thereafter, Eli managed the semipro Anderson Grays on weekends, taking a frequent turn on the mound.54 In the early 1920s he became a salesman for the Fleischmann Yeast Company. A decade later, he settled into the position of custodian-bartender at the local Eagles Club. Cates continued in club employ until he retired at about age 70. In May 1930 Edna Cates died. She was only 34.55 Her untimely passing left Eli seven children56 to raise alone (as he never remarried), and later at least one of them always lived with their father throughout his remaining years. As he aged, Eli stayed connected to baseball, often attending the home opener of the Cincinnati Reds, the club that had drafted him in 1899, and regularly watching games on television. He was also an avid supporter of Little League. In August 1956 the elderly Cates happily served on the committee arranging a local celebration for Anderson’s hometown hero, Brooklyn Dodgers pitching ace Carl Erskine.57 The following year brought a sad event: the funeral of his twin brother Levi, dead at 80. By now, Eli’s own demise was on the horizon. Suffering from various infirmities, he was admitted to Anderson Community Hospital on several occasions and died there on May 29, 1964. Eli Eldo Cates was 87.58 Following funeral services, his remains were interred at East Maplewood Cemetery, Anderson. Survivors included daughters Maxine Cates Leever and Hilda Cates McAtee; sons Jack, Eugene, Joseph, and Harold Cates; 19 grandchildren; and four great-grandchildren. Sources for the biographical detail provided herein include the Eli Cates file maintained at the Giamatti Research Center, National Baseball Hall of Fame and Museum, Cooperstown, New York; US Census, Indiana city directory, and Cates family data accessed via Ancestry.com. ; and various of the newspaper articles cited below, particularly the extensive profile of Cates published in the Anderson (Indiana) Herald on September 5, 1954. Unless otherwise noted, stats have been taken from Baseball-Reference. 1 The older Cates children were Samantha (born 1858), Nancy (1860), William (1861), Mary and Emma (1863), Charles (1868), and Robert Boyd (1868). 2 A circa 1900 Cates family photo depicts Eli’s father as a somber man with the flowing beard of a biblical prophet, while Eli and his twin brother, Levi, do not appear to be identical. 3 The 1940 US Census indicates that Eli and Levi attended school only through the eighth grade. But the 1963 player questionnaire completed by Eli himself and a posthumous one subsequently submitted by daughter Hilda Cates McAtee both stated that Eli was a graduate of Greens Fork High School. One newspaper report published during his playing days even described Eli Cates as “a college-bred man.” See the Seattle Times, April 4, 1905. 4 As recalled by Eli in an extensive profile published in the Anderson (Indiana) Herald, September 5, 1954. 6 Cambridge City (Indiana) Tribune, June 4, 1896. 7 The path of Cates’s early career is provided in the Anderson Herald, September 5, 1954. 10 As per the Cincinnati Post, December 26, 1899. Baseball-Reference has no 1899 stats for Cates. Eli also batted .242, with two home runs, for Toledo that season. 11 As reported in the Cincinnati Post, December 26, 1899, Boston Herald, December 31, 1899, and Sporting Life, January 13, 1900. 12 Some reports stated that Cincinnati released Cates to Kansas City on option for $300. See e.g., the Cincinnati Post, January 15, 1900. 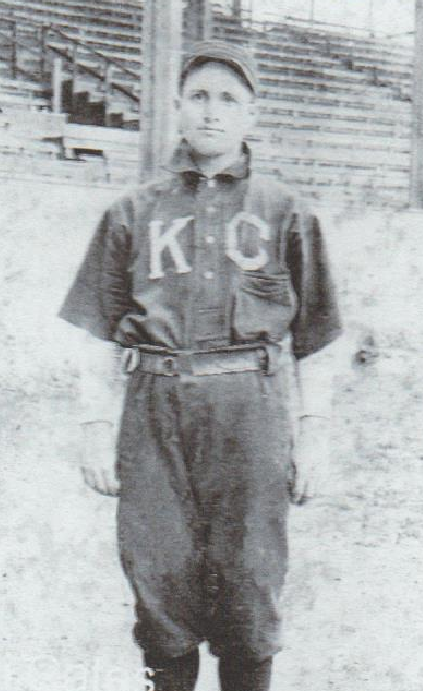 But KC club boss Jim Manning insisted that Cincinnati’s failure to sign Cates within 30 days of drafting him constituted a waiver that exposed Cates to being drafted by a high minors club like Kansas City. See the Kansas City Star, January 14, 1900. 13 As reported in Sporting Life, July 7, 1900. The week previous, the paper’s Kansas City correspondent had reported that Cates “has not made good so far this season.” Sporting Life, June 30, 1900. 14 Cates and Kathryn were married on November 4, 1900, as per the player questionnaire completed by Eli in 1963, and contemporaneous mention of the marriage was published in the Mansfield (Ohio) News, December 8, 1900, and Sporting Life, January 12, 1901. 15 By the time of the 1910 US Census, Cates was reporting his marital status as single. 16 Cates’s signing with Minneapolis was noted in the Denver Post, March 21, 1901, and Sporting Life, March 22, 1901. 17 As per the Denver Post, June 24, 1901. 18 Shreveport’s acquisition of Cates was reported in the New Orleans Item, August 15, 1901. 19 According to one Ivan Glidewell, letter to the editor published in the (Cambridge City, Indiana) National Road Traveler, April 24, 1947. 20 The New Orleans Item, August 25, 1901, noted that Cates had a “reputation in the Interstate and Western Leagues [of] beefing mightily about ball and strike calls.” Indeed, Cates and umpire Bob Caruthers had once squared off in the lobby of a Fort Wayne hotel after Cates expressed dissatisfaction with Caruthers’ work behind the plate earlier in the afternoon, as reported in the Boston Herald, Rockford (Illinois) Register-Gazette, and Rockford Republic, August 28, 1899. 21 As reported in Sporting Life, April 12, 1902. 22 The (Jersey City) Jersey Journal, July 1, 1902. 23 Cates and future Chicago Cubs star Ed Reulbach formed the core of the Sedalia pitching staff. No pitching stats were found by the writer, but Cates posted a .310 (54-for-174) batting average in 45 games played for the Gold Bugs in 1903. 24 Seattle Times, September 25, 1905. 25 As per the San Francisco Chronicle, October 31, 1905. 26 Per Sporting Life, November 18, 1905. 27 See Sporting Life, March 3 and 24, 1906. 28 See, e.g., the San Francisco Chronicle, April 22, 1907, Washington (DC) Evening Star, July 23, 1907, and the (Portland) Oregonian, October 7, 1907. 29 As reported in the San Francisco Chronicle, March 1, 1907, and Sporting Life, March 16, 1907. 30 As reported in the Washington Evening Star, July 23, 1907, and Washington Post, July 24, 1907. 31 As per the San Francisco Chronicle, January 11, 1908, Sporting Life, January 25, 1908, and Oakland Tribune, February 24, 1908. 32 Washington Evening Star, April 21, 1908. 33 Anderson Herald, September 5, 1954. 34 Washington Evening Star, August 8, 1908. Cates handled seven of eight chances successfully as the Senators second baseman. 35 See the Washington Post, January 7, 1909. 36 See Sporting Life, January 9 and 20, 1909, and the Washington Post, February 24, 1909. The transfer was to be part of a purported package deal whereby the Senators would acquire tempestuous New York shortstop Kid Elberfeld. 37 As reported in the San Francisco Chronicle, March 26, 1909, Seattle Times, March 29, 1909, and Sporting Life, April 17, 1909. 38 In addition to complaining about the umpiring, Cates expressed his displeasure at the condition of one baseball by hurling it over the ballpark wall, as reported in the San Francisco Chronicle, April 22, 1909. 39 The Seattle Times, May 1, 1909. 40 As reported in the San Diego Union and Seattle Times, May 1, 1909, and the Oregonian, May 2, 1909. Because Cates had not signed a 1909 contract with either Washington or Minneapolis, he had not been blacklisted as a contract jumper when he joined the San Francisco club. 41 Baseball-Reference provides no 1909 stats for Cates, but box scores published in Sporting Life put his Minneapolis record in the 3-6 neighborhood. 42 As per the Duluth (Minnesota) News-Tribune, July 19, 1909. Cates went 7-7 in 15 games pitched for Winona, and led league hurlers in fielding percentage (.984), according to Sporting Life, January 22, 1910. 43 See the Duluth News-Tribune, September 4, 1909, (Oshkosh, Wisconsin) Daily Northwestern, September 6, 1909, and Sporting Life, September 18, 1909. 44 Cates won his first four starts for San Diego in the brief winter league, but was released when he lost his fifth. Embittered, Cates promptly joined the Pasadena club, but had his chance for revenge thwarted by a season-closing Christmas Day loss to San Diego, 7-2. For more, see the San Diego Evening Tribune and San Diego Union, December 23 and 26, 1909. 45 As per final Northwestern League statistics published in the Oregonian, October 10, 1912. Baseball-Reference erroneously lists Cates as playing for Vancouver in 1912 and provides no stats for him that season. 46 Indiana marriage records list Eli Cates as divorced at the time of his second betrothal. The fate of first wife Kathryn Cooley Cates and her children was undiscovered by the writer. The maiden name of second wife Edna Bucy’s mother was Margaret Cates, suggesting that Edna and Eli were likely related. 47 The Cates children were Roscoe (born 1915), Eli Jackson (Jack, 1917), Virgil Eugene (1918), Joseph (1919), James (1921), Maxine Kathleen (1922), Harold (1923), Donald (1925), and Hilda (1927). 48 Per Pete LaCava, Indiana-Born Major League Baseball Players: A Biographical Dictionary, 1871-2014 (Jefferson, North Carolina: McFarland, 2015), 36. Baseball-Reference has no 1913 stats for Cates. 49 See, e.g., the Albuquerque Journal, Indianapolis Star, and Kansas City Star, November 29, 1913. 50 See, e.g., the Montgomery (Alabama) Advertiser and Rockford Register-Gazette, December 1, 1913. 51 “Sporting Gossip,” Duluth News-Tribune, December 9, 1913. 52 According to Cates in the Anderson Herald, September 5, 1954. 53 As reported in the Washington Evening Star, April 5, 1914, and Sporting Life, April 25, 1914. 54 As per the Anderson (Indiana) Bulletin, February 6, 1961. 55 Edna Cates died from “general peritonitis” (an inflammation of the abdominal wall) but no etiology is specified in her death certificate. 56 Sons Roscoe and James had not survived infancy. 57 As reported in the Anderson Bulletin, August 30, 1956. 58 Cates’s death certificate posited cerebral thrombosis as the official cause of death.